One evening Khanh’s father suffered a heart attack. Khanh called the ambulance, but it never came. Desperately Khanh got him into the back of a taxi and rushed him to the hospital. He was still alive when they staggered through the doors, but Khanh had forgotten her money. 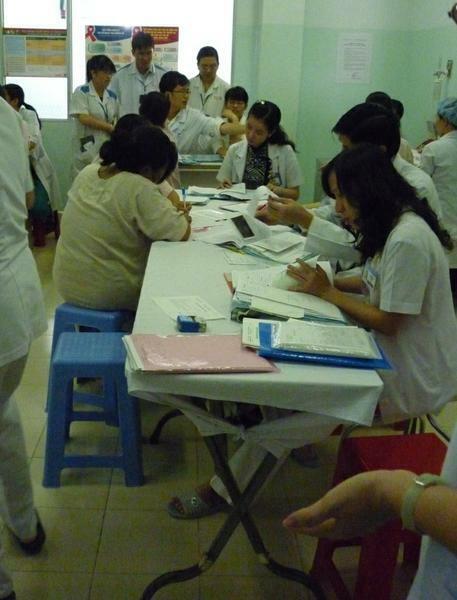 Public hospitals in Vietnam require you to pay upfront before they will even admit the patient. Because Khanh didn’t have enough cash, the hospital refused to attend to her father. He died in the hospital foyer. Mai was a 46 year old single mother with tuberculosis. A government program provided free treatment for all TB patients, so Mai went to the hospital in the city. Repeated treatments were required, so patients had to either live near the hospital, or travel in from their hometown. After a few weeks Mai’s money accommodation in the city ran out. Her symptoms seemed to have improved, so Mai returned home. Her 65-year-old mother took care of her and her young daughter, but slowly the TB worsened. Within 6 months Mai was dead. In recent years Vietnam has see outbreaks of cholera, bird flu, HIV, SARS, and swine flu. Most healthcare facilities are functioning at overflow capacity. Doctors routinely see more than a hundred patients a day, and have just a couple of minutes with each. Though healthcare is meant to be available to all, the reality is very different. Those without money, relying on government-provided health insurance, will often get substandard care, facing long waits, crowded facilities and very limited treatment options. Pray for the sick and suffering in Vietnam, many of whom are marginalized by their illness. Pray for Christian healthcare workers, that they would be living examples of Jesus through their work. Pray for Christian workers to pioneer other areas of health care, such as physiotherapy, hospice care and HIV/AIDS treatment.